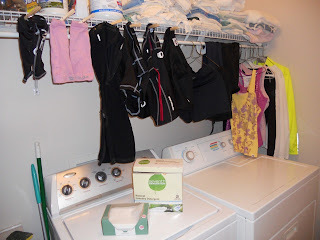 Scenes like this one in my laundry room make me laugh. 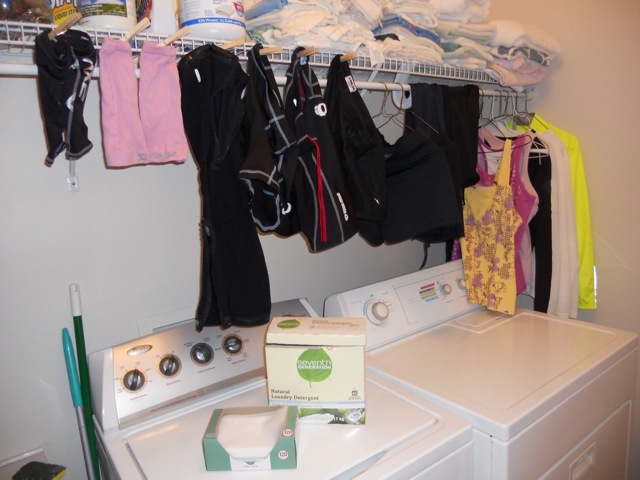 The workout clothes get washed separately from the lowly "everyday" clothes and hung to dry with great love, care, and respect. My work and everyday clothes? It's a survival-of-the-fittest approach. If you can't survive the washer and dryer and then go directly to my body without ironing, I'm not interested. And dry cleaning? Forget it. Who has time for that nonsense? This is why I will never be nominated for "best dressed" at the office. That and the fact that I won't wear shoes that might negatively impact the health and wellness of my feet. I am a no-frill, no-nonsense girl. This point is driven home when I see folks in the pool and gym locker room who take 30, 45 minute to primp for work and have bags of products, appliances, and things that I don't even recognize. My transition time? About 8 minutes to shower, get dressed, dry my hair, and fly out the door. Who has time for that other stuff?